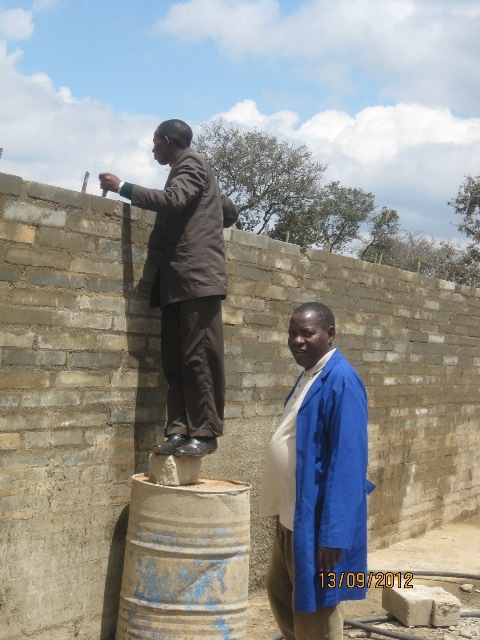 Two corporations in Oregon, (USA), have donated some money for the clean water project supervised by Hanga abbey in southern Tanzania. The first corporation is the Basin Sunrise Rotary Club of Klamath Falls, Oregon. The club donated $2,500 through a group of students and professors of Oregon Institute of Technology college working under USA Engineers Without Boarders. The group has been working to build a filtration facility for water system that has been drawn from the mountain. The filter system has been under construction for two years. 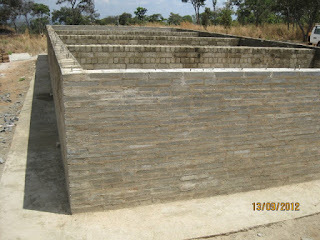 It involves erecting walls of concrete bricks, installing pipes, and filling the tank with gravel and sand. So far the tank has been erected. Next summer, June/July 2013 the group will be able to finish the project by installing pipe system and filling the facility with gravel and sand. Pictured below from right: Kristy, Jordan (holding a check from Sunrise Rotary Club) club president, Terry Torres and Fr. Ildefonce Mapara, OSB. Photos of the filtration tank to be filled with gravel and sand, the work of the group of students and professors from Oregon Institute of Technology. Also , Oregon Community Foundation, a non profit foundation that supports community activities in Oregon, USA, and is funded by individuals and other foundations, has awarded $1,000 to St. Maurus Mission this December 2012 for clean water project. The funds will be used toward getting villagers clean water in southern Tanzania in digging wells and installing hand pumps. In the pictures: Fr. Ildefonce Mapara, OSB, is delivering a speech to thank the Oregon Community Fundation for their donation for clean water project in southern Tanzania and sitting with other representatives who got awards for different community activities in Oregon. After hosting Benedictine Union of Tanzania superiors in November, early December 2012 the priests of the archidiocese of Songea, southern Tanzania, had their annual retreat at Hanga Abbey. The monks were happy to host them in the new guest house facility of St. Pirmin. The priests were happy too to be able to use the new comfortable rooms in the guest house. We welcom them back any time. After their recollection a photo of the priests was taken in front of St. Pirmin guest house. A long waited request, finally, Hanga dispensary has been raised to a status of Health Center last October. With the title it will be allowed to legally offer more services which dispensaries are not permitted to offer. The Health Center for example will be able to offer minor surgeries done either by resident or visiting surgeons. Good news for areas around Hanga village is that now women with complications during delivering babies will not need to be referred or transferred to bigger hospitals. Besides many people around Hanga will not have to incur expenses for services that formally were not available at the dispensary. Now that Hanga dispensary is a Health Center it is necessary that it has to have surgery unit. Thanks to benefactors from Italy construction is in progress. 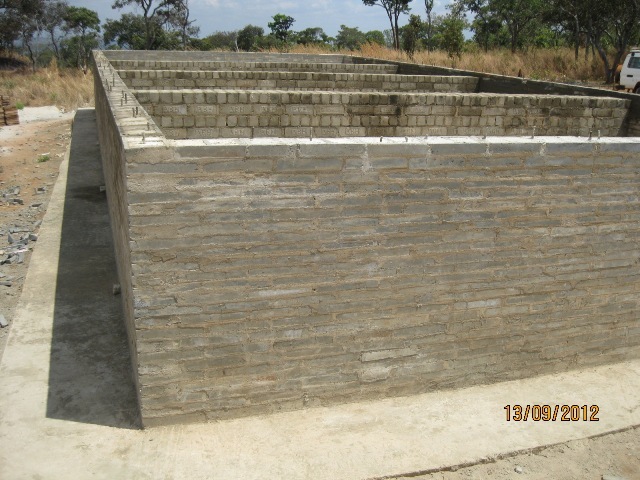 Bricks, sand, gravel, are at the site of construction and the foundation of the building has been dug ready to begin building (see photos below). Frater Lucius and Frater Josephat at site. Another event at the dispensary is the welcoming of seven student nurses from Peramiho hospital (about 70 km from Hanga). They are doing their field experience for a month. You can see them in the photos below.